Is This Park Poisoning Dogs? 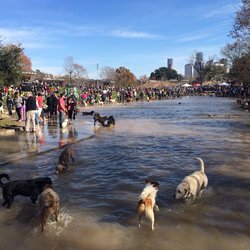 Located in Houston, Texas right next to Buffalo Bayou, Johnny Steele Dog Park appears to be like any other playground for pets. But with complaints coming in about dogs getting sick, appearances might be deceiving. Could it be in the water? Meet Charlie a healthy and playful three year old orange pointer, who enjoys his time at the park with his owner Mike Patsch. Patsch tells KHOU, “When it opened up last year, it was exciting to have it. Then a month or two into it, the water started turning all kinds of funky colors.” It was then that Charlie started to get sick and they both haven’t been back to the park since. Even a simple Google search yields complaints about the water. One reviewer warns, “Don’t go if your dog drinks the water. While swimming my dog wound up sick with coccidia.” Coccidia is an intestinal parasite and if left untreated can cause which causes watery mucus-like diarrhea. In advanced cases blood may be present. Other symptoms include vomiting, loss of appetite, dehydration and in some instances, death. Many veterinarians caution dog owners about communal drinking water and recommend that everyone bring their own water and bowl. And if there is a pond or swimming area located within the park, exercise extreme caution. What other tips do you have to keep your pets safe in dog parks? Comment below.